Home Tags Posts tagged with "clicker training"
Hi guys! Today I will bring up a topic you have asked me about for years. How I taught Batman tricks! I started to teach Batman to lie down on cue in 2012/2013, and that was his first “real” trick. With Batman, I prefer to use positive reinforcement in trick training. That means that I praise him when he takes one step in right direction. I praise every single attempt, and if he is confused, I’m not clear enough, and we simply take a break. I won’t push, punish or force him to do the wanted behavior. 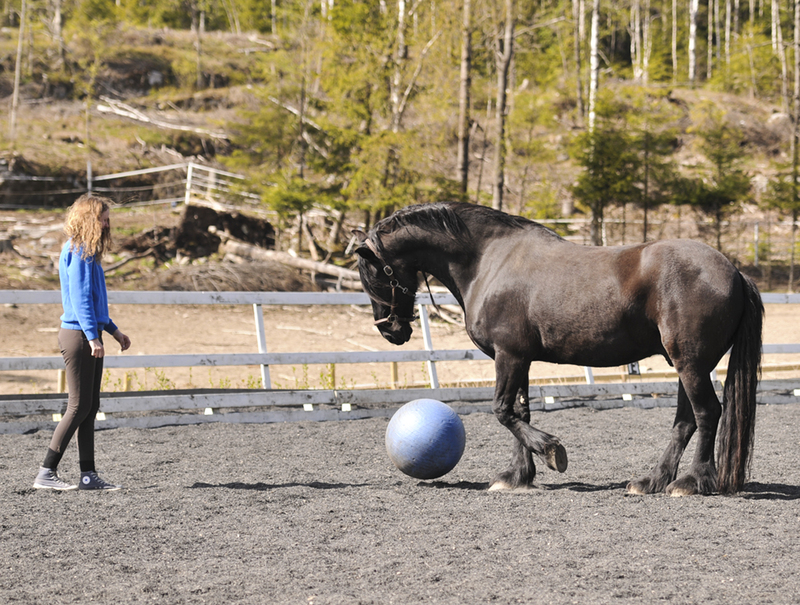 If I want to teach my horse to walk after a ball, I first praise the horse when the horse looks at the ball. 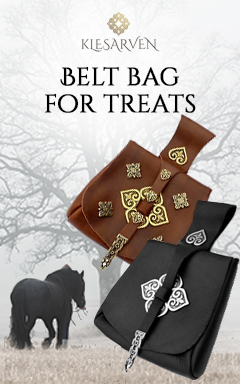 If I want to teach my horse to look away from the treat, I praise the horse when it turns its head in another direction. 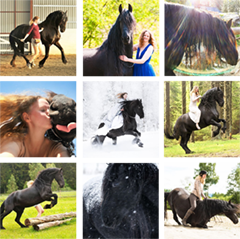 If I want to teach my horse to pick up a whip, I praise the horse when he touches the whip. Simple as that. 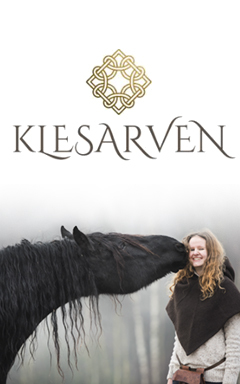 It requires patience, correct timing and a basic relationship with your horse from the ground. 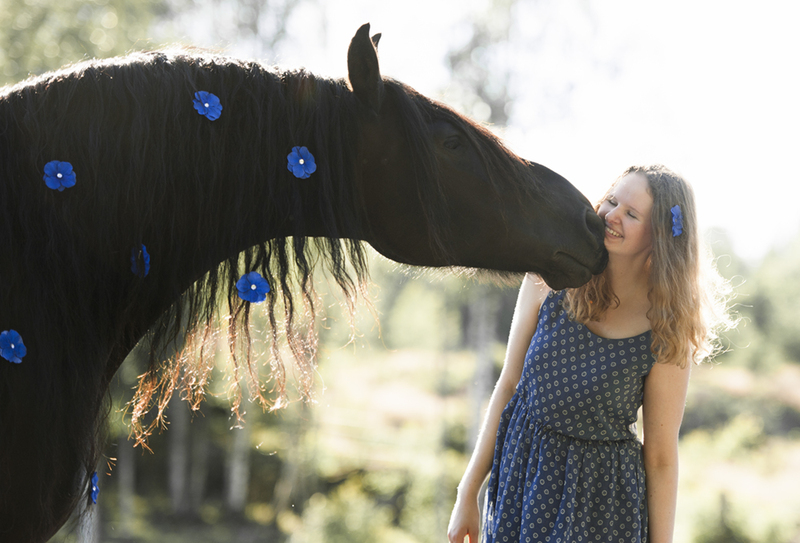 You can use positive reinforcement on all horses, turtles, whales, eagles, boyfriends and squirrels. 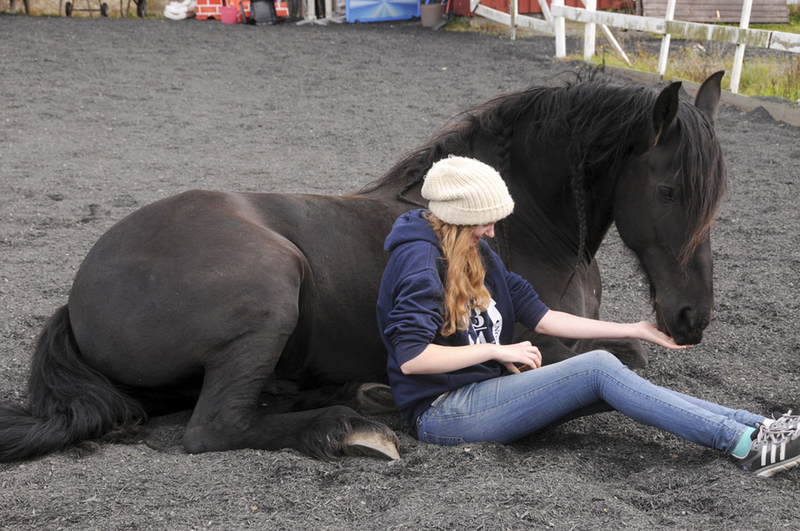 Read more about positive reinforcement and horses on www.empoweredequines.com. 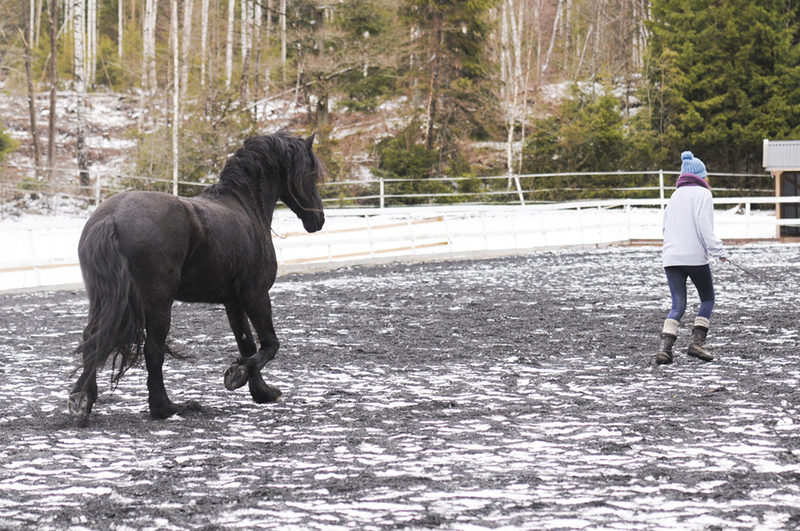 Trick training certanly made Batman a prouder, more willing, happier and a more curious horse. He became more outgoing and fun to be around. He started to show a different side of his personality, the silly, fun Batman I love so much suddenly appeared for real. 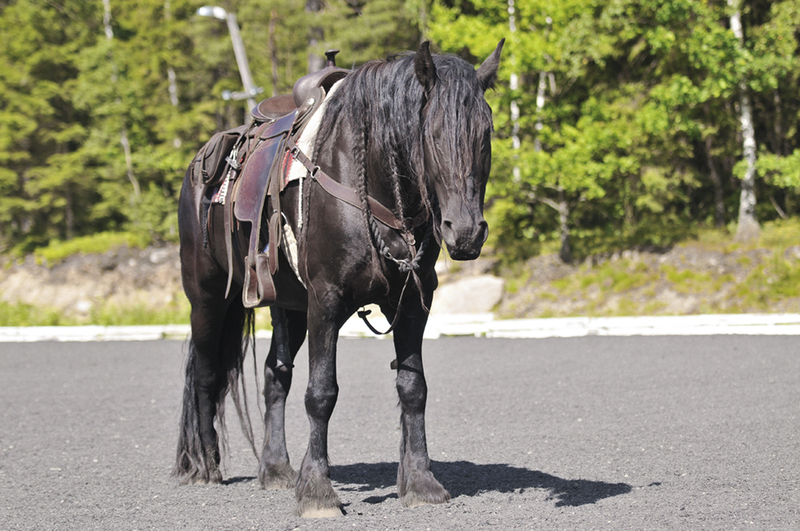 Everything is easier to teach a horse that is eager to learn, and finds training fun. And what is fun training? Training where you get challenges, and praise when you understand the task, training completely free from punishment and fear. Teamwork, happy moments, new experiences, and the chance to spend time together and have fun from the ground. Please keep in mind that I’m not a professional or a trainer, and this blog post is based on my personal experience with Batman. 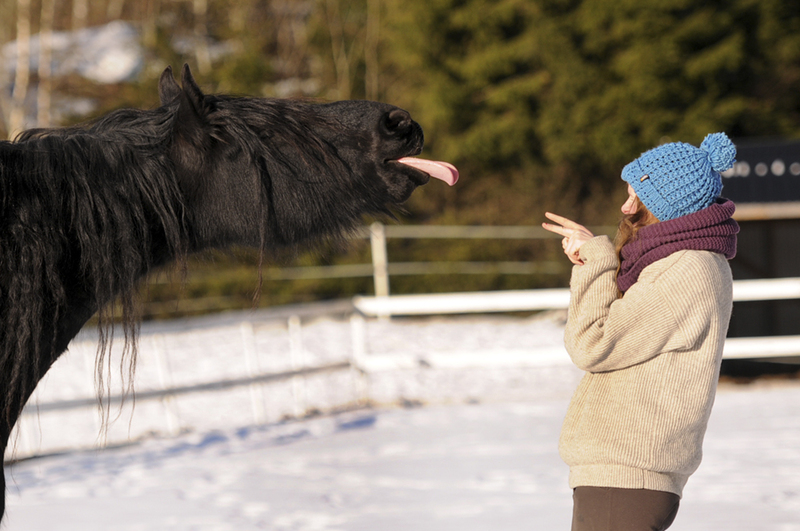 I highly recommend you to seek help from a trainer, simply to learn the basics of timing, equine psychology and behaviour when it comes to clicker training. I recommend www.pluvinel.com to find a trainer near you. I remember so well that I loved playing with my dog when I was younger; we had so much fun together. I taught her 50 tricks using positive reinforcement and body language. I had no idea about what I was doing, I simply tried! We ran around all day long, jumped, climbed, balanced and rested. 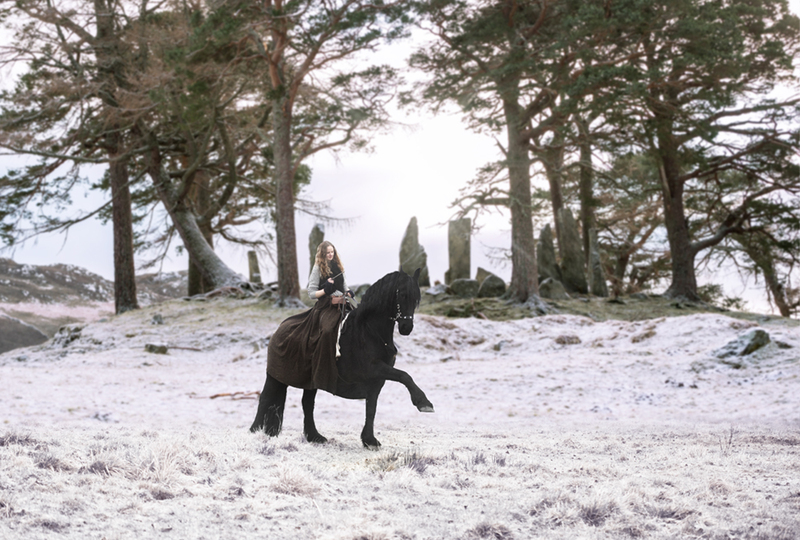 I even taught her some dressage moves! 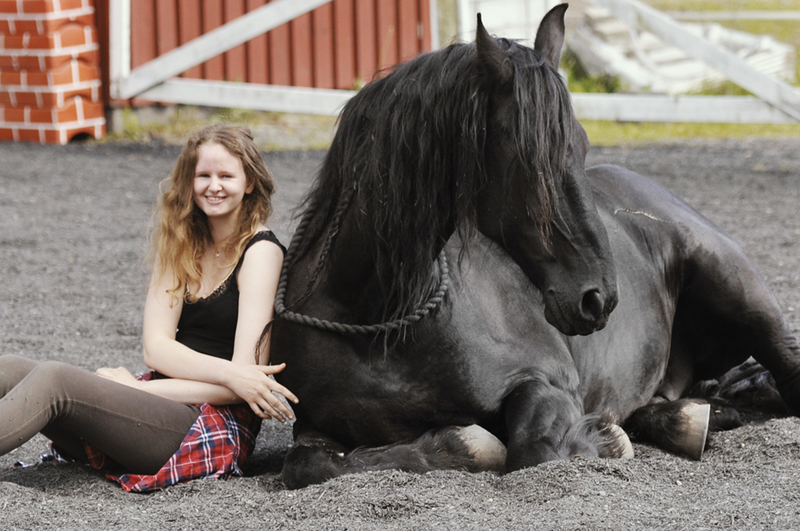 My dream was to have the same relationship with a horse. Now I have the excact same relationship with Batman, and play with him the same way. 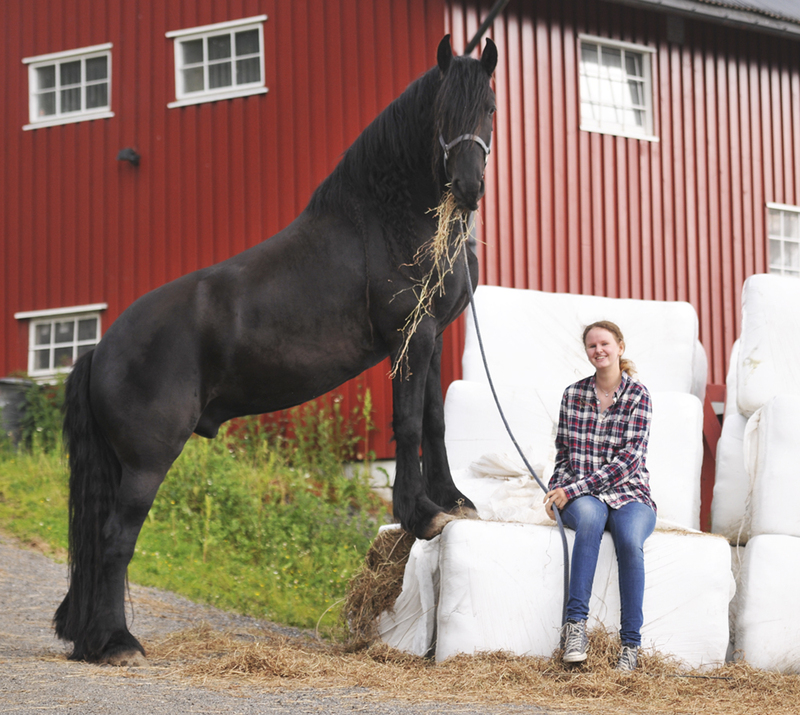 He is 600 kg heavier, but the feeling of a true connection to an animal remains the same. It is magic. And for that, I’m forever grateful to my dog, who let me experience it for the first time. Thank you dear Dora! Other liberty basics is not included in the list. So! How did I teach these tricks? I simply praised the wanted behavior when he naturally offered it. Most of the tricks are taught randomly, and many of them taught on rainy and windy days, because Batman’s energy level raises when the weather is chilly. Batman smiles after eating an apple? I added a cue by praising the behavior over and over again, until he connected the cue with the behavior. 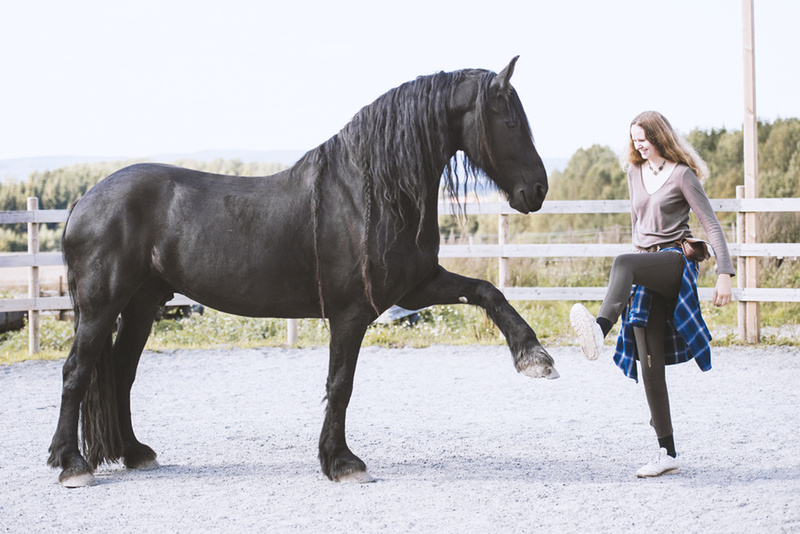 When you have done this a couple of times, the horse will easier learn new tricks, because it will be more observant of your body language and feel familiar with the procedure. 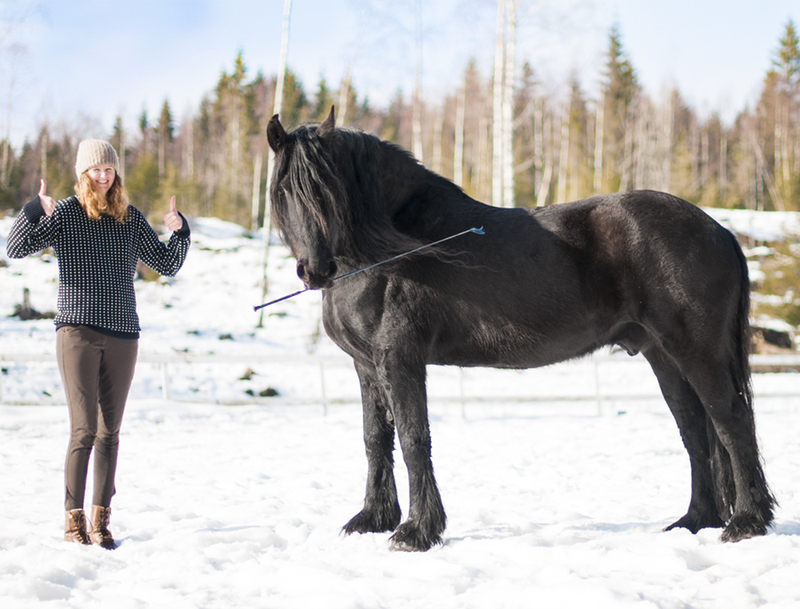 Clicker training makes the horse more curious and attentive is my personal experience. All of my tricks, except from head down, stand on pedestal and rear (bridle and regular halter for guidance) is taught at liberty. 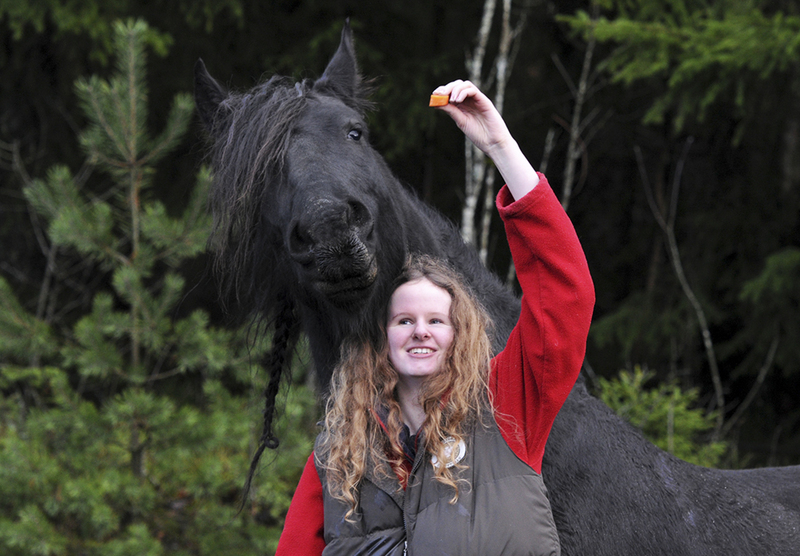 Carrots and a large arena. Simple as that. 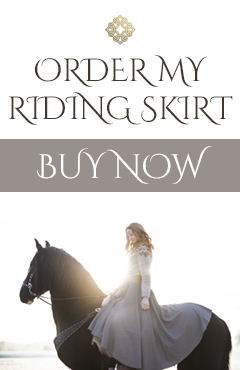 Now, Bat will follow me wherever I go, but it is definitely a good idea to have a cue to bring the horse back to you, especially when doing liberty canter work. 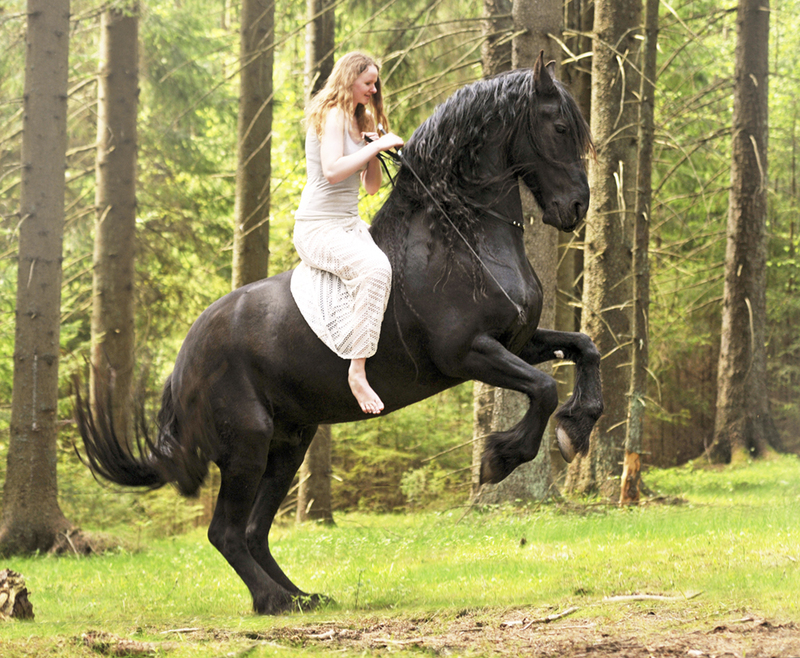 Batman first did this in walk, but now does this in canter and trot too. Another basic, but brilliant trick. I can literally park Batman everywhere and leave him there. It is great when you are into driving, or if you are forgetful as I am. I often forget my treats, helmet and so on, and it is nice to park Batman outside the tack room and head back in there. I use this trick on a daily basis. The vocal cue is “stå”, and to reimain standing from longer distance I also uses “bli”. Which means stay, and remain there. The first “cool” trick I taught Batman! First by lifting my own leg and touching his front leg at the same time. The first time he lifted the front leg, it was just 2 cm, but he got tons of praise for the attempt and I encouraged him to continue. He then tried to lift the leg higher and higher, until we got a jambette. My cue is to point on his shoulder or lift my leg. Taught from the ground through playing. He once reared when I played with body language and energy a rainy day during spring. It was cold and windy and we was inside the riding arena. 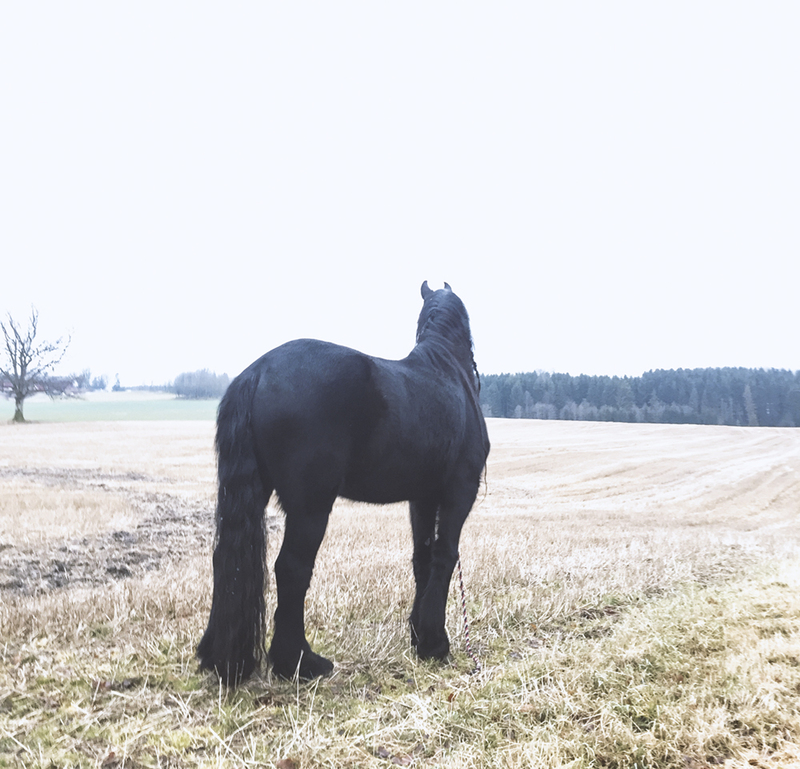 He then reared when I moved towards his hindquarters, and I praised him immediately, as I was searching for a way to make him dare to express his energy through rearing. Later the cue had to be perfectionized, which took around a year before I had an okay result. 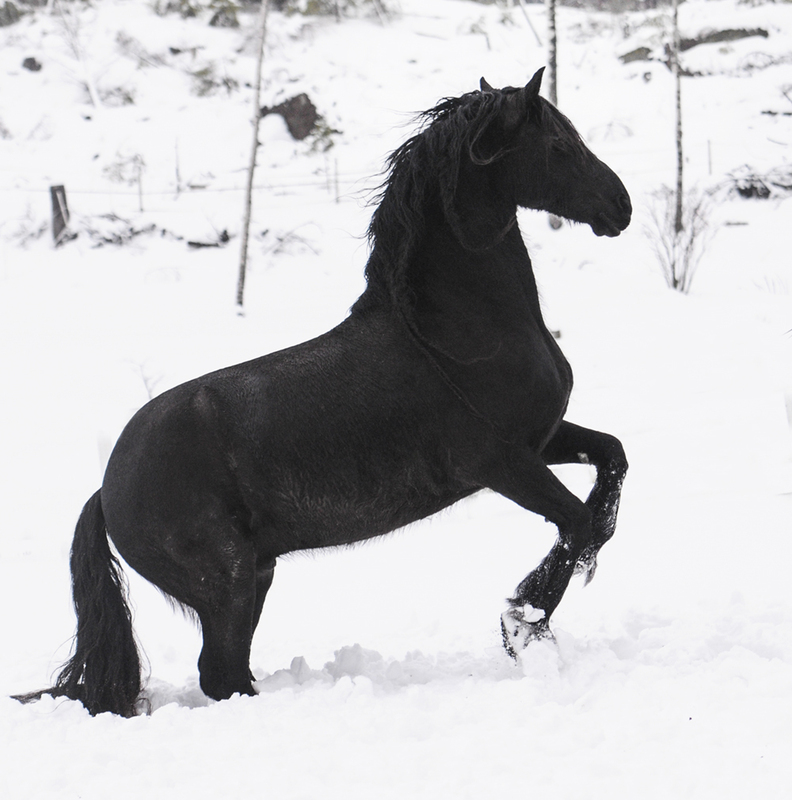 I use the same cue when I ride him, and do not focus on the front legs in the rear at all. All I cared about was the angle and the placement of the hindquarters, I wanted a safe and balanced rear, not a “stiff hind legs, bent back, tense neck, bad balance”-rear. I have already written a very long and detailed blog post about this one, and you can read it here. I waited a long time with this one, because bringing a huge horses head towards your skull is not a really good idea in the first place. The first step was to teach him to lift his head, and that one was easy, because he already knew to follow my hand. So I simply lifted my arm and praised him when he followed. It took a day or two untill he knew how to kiss me gently on the cheek when I lifted my hand and pointed. I later added a “kissing sound” (haha) so now he will kiss me with a vocal cue. I no longer use my hands. 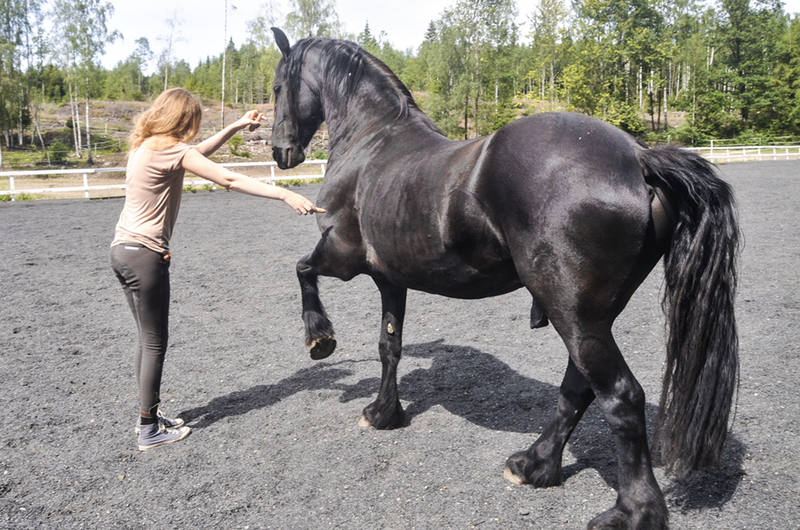 I am glad I waited with this trick, the result is a super gentle and careful horse, and I always gotta ask him twice when I have not done it earlier that day. I recommend this blog post about the trick. Feed the horse something with a weird taste. Add a cue to the reaction. Simple as that. 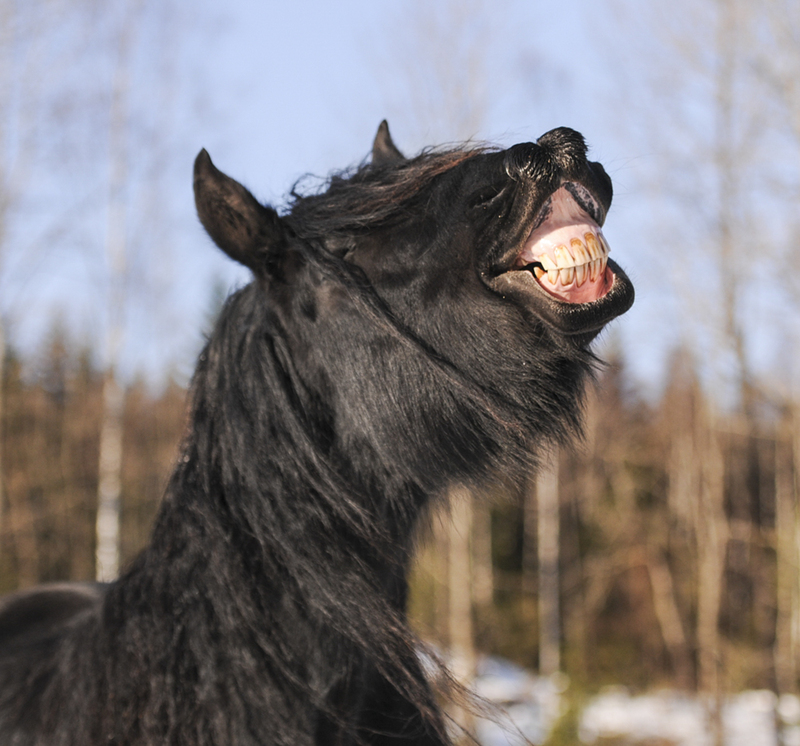 Batman always smiled when I gave him treats from Sweden actually. I added a vocal cue for this one too, by coincidence! So this one is definitely my weirdest cue ever, it is the sound “uhmmmmmm”. I also think he forgot how to smile, I have not practiced this one in a while. 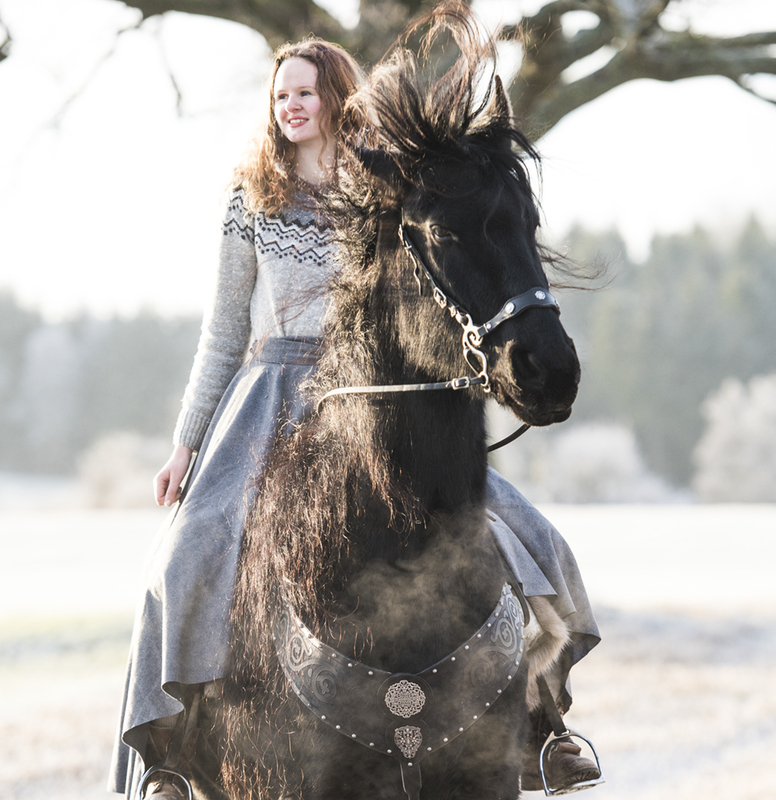 It is a plus if the horse knows jambette from before. I simply asked Batman for jambette when he stood in front of a hay bale or pedestal, and then he lifted the leg towards the pedestal. When the hoof hit the pedestal, I praised him. I encouraged him to lift the foot higher, until he rested it on the pedestal. The next step is to ask the horse to do the same thing with the other front leg, and walk more towards the object you want it to stand on. 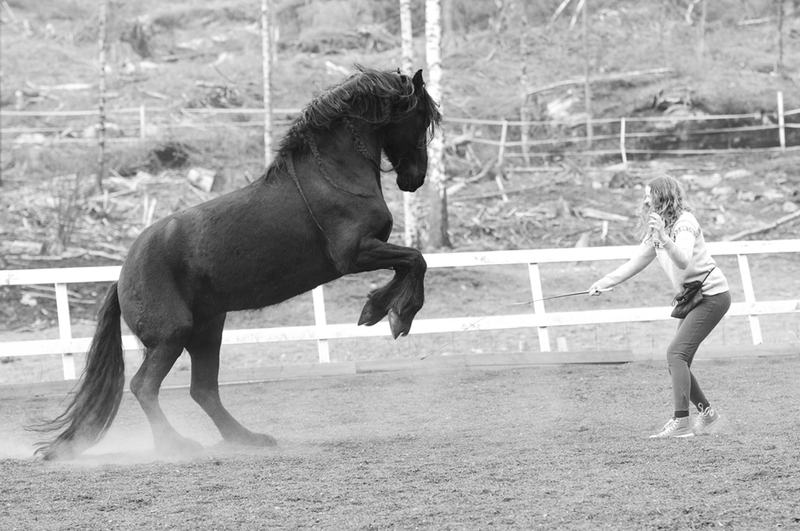 The first time Bat did this was in Hällekis in 2012 and he it took me 5 minutes to teach it! I taught Bat Spanish walk by asking for a jambette on one leg, run over to the other side, ask for jambette on the other leg, and praise, so he got used to lift them both on shorter intervals. The next step was to be able to ask him to lift the opposite leg with me remaining in the same position, which went well too. Then I started walking slowly forward with him. One step at the time, the Spanish walk started to appear. Practice makes perfect! I held the whip in front of Batman, and praised him when he touched it with his muzzle. When he tried to chew on it, I praised him even more, and later he could hold it for a couple of seconds. Then I placed the whip on a chair, and then on the ground. Also a result of jambette and Spanish walk. I placed a yoga ball in front of Batman and asked him to lift his front leg, until he touched the ball and pushed it away. 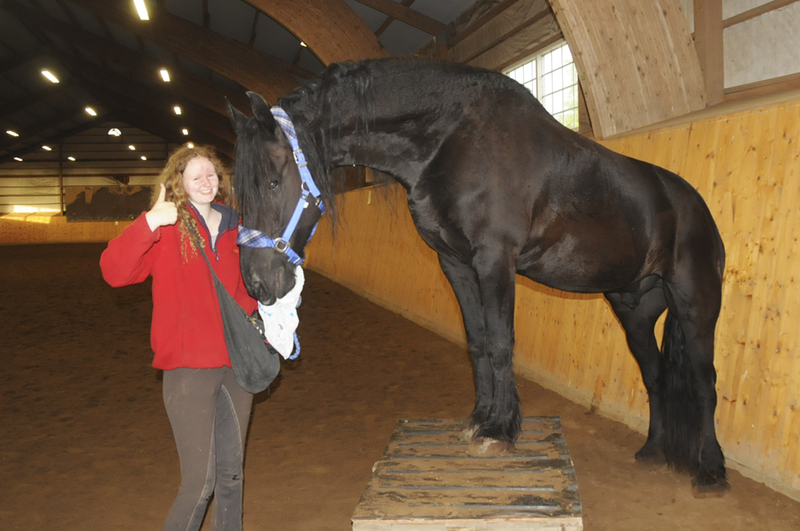 I recommend a large ball for tall horses, because Batman’s ball got stuck under his belly a lot. 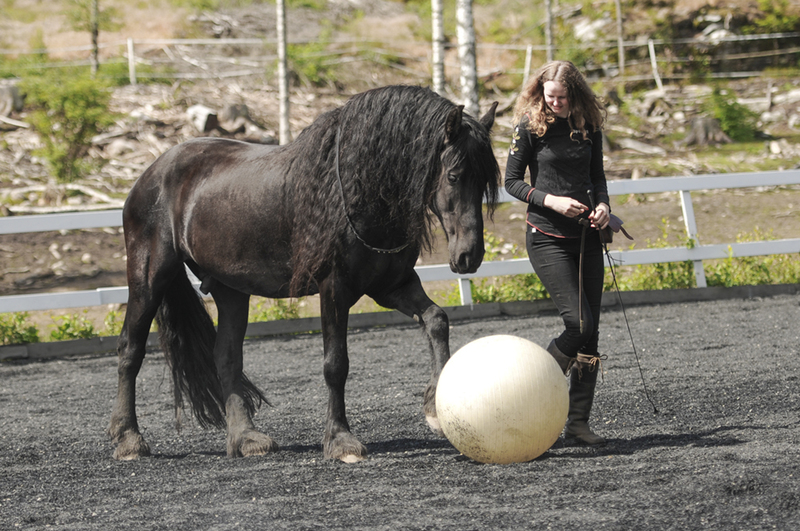 He is a chill horse, but a larger yoga ball is recommended. I then asked him to walk towards the ball and kick it, and later walk after it and kick it again.